Historic house museums aren’t just for Early American revolutionaries, pioneer settlers or Victorians any more. 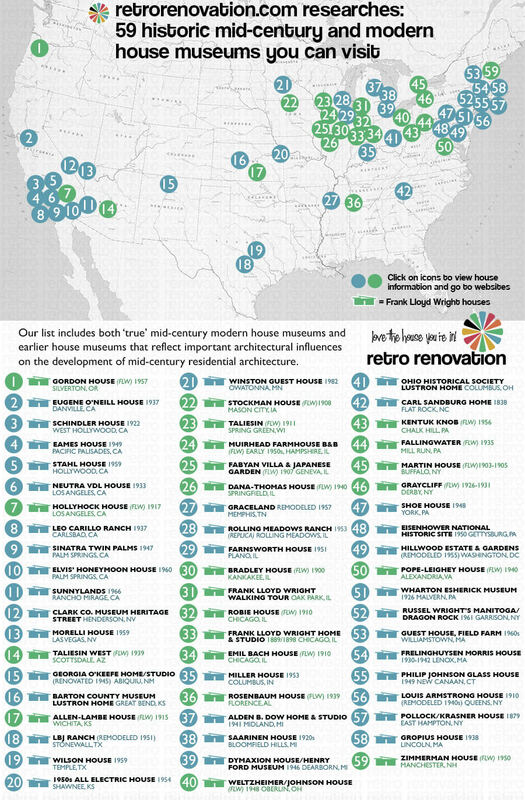 Yes, as appreciation for mid-20th century architecture has grown, so has the number of historic house museums. Kate and I have been working for several weeks to research and prepare what we believe is the first conclusive list of mid-century and modern historic house museums that you can visit and see. In the USA. In your Chevrolet, even. Our list includes 59 mid century and modern house museums. A number of these are iconic, architect-designed “mid-century modern” masterpiece houses. But we also were somewhat liberal in including other early- and mid-20th historic houses that played key roles in the evolution of mid century residential architecture and the “modern” way we still live today. There are quite a few houses by Frank Lloyd Wright that fall into our “extremely influential” but not really “mid-century” category, for example. Houses generally become “historic” for one of two reasons (or both): (1) Their architecture is special, or (2) Someone historic lived there. Reflecting this, the houses in our roundup are there for a variety of reasons — and we believe this diversity helps illuminate the story of mid-century America. In addition to the houses that are important examples of mid century and modern residential architecture, our list includes celebrity houses where Elvis, Sinatra, and Louis Armstrong lived… a number of “biographical” houses including from Russel Wright, Georgia O’Keefe, and Jackson Pollock and Louise Krasner… There are two presidential estates… and we dug and dug and dug to find two Lustron houses open to the public! We take the research all the way to one “post modern” house, a 1982 design by Frank Gehry. Don’t be harassing us, please, if you don’t like the way we sliced and diced the list; be nice; we were trying to show the love for 20th century modern and modern-esque houses that haven’t quite made it onto others’ formal lists yet. Also, we started to get cross-eyed after a while of hashing what’s “in” the list and “what’s out”. We kinda wanted to be done already. Readers, did we miss any mid century or modern historic house museums? If so, please let us know!In all cases, the houses had to be open for tours. Some are open all the time. Some require reservations. So call ahead. Our map is interactive — hover over any of the dots to see the name and year of the house. Click on the dot to get to either the house’s website or, if we’ve written about the house, the link will take you to our story. With our stories, we always try to get lots of great photos — more than you are likely to see on the house’s website. I don’t think I saw this on the list, but there is also the Frank Lloyd Wright-designed Westcott house in Springfield, Ohio. While in Springfield you see a rare surviving example of the Westcott automobile at the nearby Clark County Heritage Center, also home to an impressive collection of working vintage neon signs. Springfield is about 45 minutes from the Lustron in Columbus, Ohio. Leroy Anderson spent the summer of 1946 at Painter Hill in Woodbury, Connecticut. It was here that he composed Sleigh Ride during a heat wave. Two years later the Andersons settled in Woodbury permanently, first to Eleanor Anderson’s mother’s house on Painter Hill Road. The Andersons built a modernist home on Grassy Hill in 1953. During these years Leroy Anderson wrote many of his well-loved compositions. The Leroy Anderson House was designed by architect Joseph Stein (1916-1977) of Waterbury, Connecticut and was constructed (1953-1954) by the McGinn Company of Naugatuck, Connecticut.